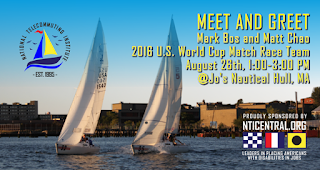 For Release Thursday, August 25 2016 at 12:00 p.m.
National Telecommuting Institute (NTI) is proud to be hosting two legally blind international competitive sailors from the US team for the 2016 US World Sailing Blind Match Racing World Championship team at their summer event, which will be held at Jo’s Nautical in Hull, MA on Friday, August 26, 2016 from noon until sunset. Blind sailors Mark Bos from Gloucester, MA, and Matt Chao from Newton, MA will be at the event to present on many aspects of competitive blind sailing, including blind individuals competing in sailing regattas. 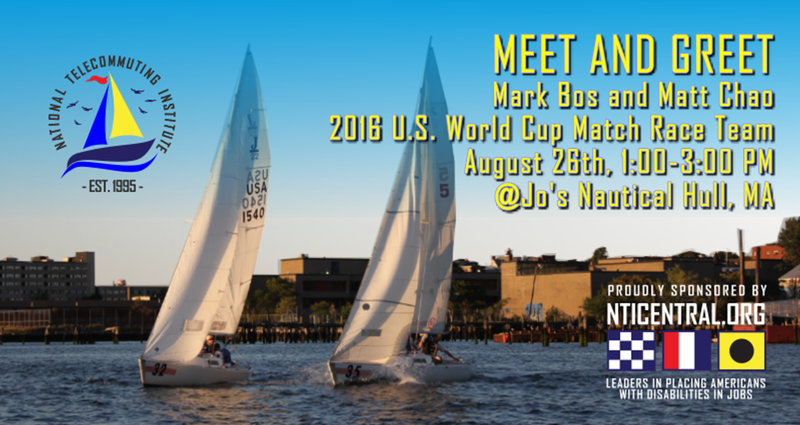 Members of the media are invited to this event from 1 to 3 p.m. to learn more about Bos, Chao and the US World Sailing Blind Match Racing World Championship, while also helping to spread the word on what individuals with visual impairments can accomplish. NTI is one of the main sponsors for the United States team in the 2016 World Sailing Blind Match Racing World Championship, which will be held in Sheboygan, WI, from September 19 through the 25 of 2016. The Blind Match Racing World will be held in correlation with the Women's (able-bodied) Match Race World Championship. These events include some of the world's top sailors who are visually impaired and some of the world’s greatest female sailors. The US Sailing Center of Sheboygan and World Sailing will host the World Championships of Blind Match Racing on Wisconsin’s Lake Michigan shore. It is the mission of the US Sailing Center of Sheboygan to develop abilities in sailing and seamanship in individuals to the extent of their capacity. The Center believes that regardless of age, income, ability, or disability, those who come to understand the fundamentals of sail trim, teamwork, and seamanship understand more about themselves, their fellows, and their world.